from negativity to positivity; from restrictive to creative; limited to unlimited. Satyananda Yoga Center, a non-profit organization, in Austin, Texas, offers yoga classes for everyone in the community. People of all ages, including children, can sign up for one or more of the classes. Classes are held at different locations for your convenience. Some of the places where classes are held include wholistic centers, cultural centers, recreational centers, schools, community centers, hospitals, wherever there is a need or demand. Yoga is an experiential science. Come experience the science of yoga for yourself! When it comes to classes offered, they are based on age, ability and need. All classes teach poses, Asana; using the breath, Pranayama; relaxation techniques such as Shavasana and Yoga Nidra from Pratyahara; concentration techniques to focus and calm the mind from Pratyahara, Dharana and Dhyana. The Science of yoga starts with branches of yoga followed systematically, each as per its aim, as taught in Bihar School of Yoga Ashram in Munger, Bihar, India. 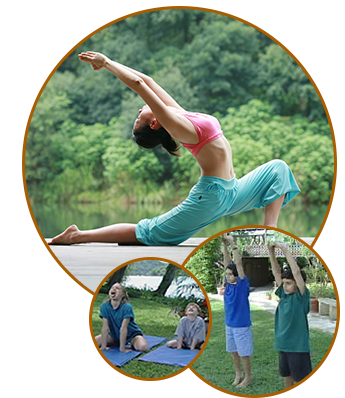 The Beginner, Intermediate, Advanced yoga classes of Satyananda Yoga Center take you systematically through some aspects of the branches of yoga as per the Bihar School of Yoga & Satyananda Yoga teacher training. As far as levels, classes are based on the need and experience of the individual. Classes are for beginners, intermediate, and advanced level individuals. There are many other activities and events that are hosted. For instance Shatkarmas (cleansing, detox techniques) are taught once a month. Kirtan, havan, and vegetarian potlucks are held once a month; Workshops, seminars, and retreats are also scheduled.